St. Matthews is one of the state's major shopping areas, home to the second- and fifth-largest malls in Kentucky (Mall St. Matthews and Oxmoor Center), along with many smaller shopping centers along Shelbyville Road. Dating the arrival of American Indians to present-day Kentucky remains controversial, with estimates ranging from 40,000 to 10,000 years before the present. As with later European cultures, indigenous cultures were often divided near the falls of the Ohio River, which marked a transition zone in travel and settlement. During the late Woodland period (c. 1st century), this area was between the Ohioan Hopewell Culture and the Illinois Crab Orchard Culture that extended to the west. Later (c. 1200), it was the boundary between the Mississippian and Fort Ancient cultures. During the 18th century, the area was claimed by various Indian tribes, including the Shawnee from the northwest and the Iroquois to the east; based in New York and Pennsylvania, the Iroquois used the Ohio Valley as a hunting ground by right of conquest. The area eventually known as St. Matthews was first settled by European Americans in 1779 during the American Revolutionary War by Col. James John Floyd of Virginia. He had conducted an important survey of the Jefferson County area in 1774, and bought 2,000 acres (8 km2) of land from Virginia and other colonial veterans who had been awarded the parcels for their service in the French and Indian War (known as the Seven Years' War in Europe). He arrived overland on November 8, 1779, bringing several family members and a black slave. They built cabins and a stockade, which came to be known as Floyd's Station. During the early 19th century, the area held several plantations and was known as the "garden of the state". As with most areas of the Inner Bluegrass Region, the area was settled by many migrants from Virginia, who brought slaves for labor. The major crops were labor-intensive tobacco and hemp; breeding livestock, primarily horses, was also important to the economy. There were some changes to mixed crops because the soil was exhausted from tobacco. In the years before the Civil War, Kentucky planters had a surplus of slaves and sold many at markets in Louisville to traders who took them to the Deep South in the domestic slave trade. Demand was high as the South was being developed for sugar and especially cotton. The invention of the cotton gin had made cultivation of short-staple cotton profitable. The St. Matthews community developed around the present-day intersection of what are known as Breckenridge Lane, Shelbyville Road, and Westport Road. By 1840, it was known as Gilman's Point, after local tavern owner Daniel Gilman. The name "St. Matthews" was adopted in 1850 after the completion of St. Matthew's Episcopal Church, the area's first. It became the official name in 1851 when the newly opened United States post office adopted it. Later numerous other Protestant churches were soon founded, including Baptist. Holy Trinity, the oldest of the three Catholic churches in the city, was completed in 1882, following immigration to the area of Catholics from Switzerland and Germany. Trinity High School was established nearby in association with the church. St. Matthews was connected to the Louisville, Cincinnati and Lexington Railroad, as well as a later railroad that connected Louisville to Anchorage and Middletown. The railroad did not greatly alter the economy of St. Matthews, however, which remained heavily agricultural well into the 20th century. In the early 20th century, it produced so many potatoes that it was a major center of the country for this crop. From 1910 to 1946, it was home to the St. Matthews Produce Exchange, which was once the second-largest potato shipper in the country. The area began changing in the early 20th century as a result of urban transit and automobile traffic. Gradually the farms were subdivided and developed as residential areas. The original landowners' names – including Brown, Rudy, Nanz, Monohan, Oeschner, and Stich – were used for local streets. The town's first bank was founded in 1905. A modern shopping district began developing in the 1920s, to include the landmark Vogue Theater, opened in 1938. Growth of the area was accelerated by the Ohio River flood of 1937, which caused many families to leave low-lying ground in Louisville and move to St. Matthews. It incorporated as a city in 1950, partially to address infrastructure problems and to build a sewer system. The Mall St. Matthews, Louisville's first indoor shopping mall, opened around this time. In 2001, St. Matthews annexed the cities of Broad Fields, Cherrywood Village, Fairmeade, Plymouth Village, and Springlee. St. Matthews is located at 38°15′0″N 85°38′33″W﻿ / ﻿38.25, -85.6425 (38.249931, -85.642613). According to the United States Census Bureau, the city has a total area of 4.0 square miles (10 km2), all land. The present boundaries of St. Matthews are roughly Cannons Lane to the west, I-264 to the south and east, and several subdivisions off Brownsboro Road to the north. These include Bellewood, Brownsboro Village, Maryhill Estates and Windy Hills. The separately incorporated cities of Richlawn, Beechwood Village and Norbourne Estates are enclaves within St. Matthews. As of the census of 2000, there were 15,852 people, 7,978 households, and 3,661 families residing in the city. The population density was 3,938.3 people per square mile (1,518.7/km²). There were 8,537 housing units at an average density of 2,121.0 per square mile (817.9/km²). The racial makeup of the city was 90.32% White, 4.95% African American, 0.15% Native American, 2.62% Asian, 0.01% Pacific Islander, 0.59% from other races, and 1.36% from two or more races. Hispanic or Latino of any race were 1.69% of the population. There were 7,978 households out of which 19.0% had children under the age of 18 living with them, 34.9% were married couples living together, 8.4% had a female householder with no husband present, and 54.1% were non-families. 45.2% of all households were made up of individuals and 14.1% had someone living alone who was 65 years of age or older. The average household size was 1.94 and the average family size was 2.76. In the city the population was spread out with 17.0% under the age of 18, 10.2% from 18 to 24, 35.6% from 25 to 44, 20.1% from 45 to 64, and 17.1% who were 65 years of age or older. The median age was 37 years. For every 100 females there were 86.6 males. For every 100 females age 18 and over, there were 83.6 males. The median income for a household in the city was $42,219, and the median income for a family was $56,473. Males had a median income of $37,306 versus $31,163 for females. The per capita income for the city was $28,601. About 4.9% of families and 6.7% of the population were below the poverty line, including 7.8% of those under age 18 and 5.4% of those age 65 or over. ^ a b Commonwealth of Kentucky. Office of the Secretary of State. Land Office. 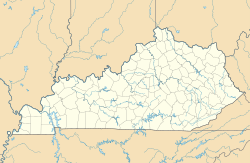 "St. Matthews, Kentucky". Accessed 26 Aug 2013. ^ St. Matthews is the city's formal name, although it is also informally written as Saint Matthews and St. Matthew's. ^ Yater, George H. (1987). Two Hundred Years at the Falls of the Ohio: A History of Louisville and Jefferson County (2nd ed.). Filson Club, Incorporated. pp. 12–13. Wikivoyage has a travel guide for Saint Matthews. This page uses content from the English language Wikipedia. The original content was at St. Matthews, Kentucky. The list of authors can be seen in the page history. As with this Familypedia wiki, the content of Wikipedia is available under the Creative Commons License.